My book THE RETURN OF THE COURTESAN has been listed in the top ten of Venice inspired books for 2017 by The Venice Insider website. I am needless to say honoured and delighted! Check out the link for other fantastic books and all kinds of fascinating information on Venice. I will be celebrating later and clinking goblets with The Man with the Blue Sleeve. First there are the moustaches. They flow out of Brangh’s nose, sweep across his cheeks and end up about an inch from the lobes of his ears. They are described by Agatha Christie as ridiculous and these ones certainly are. There’s a rather worrying moment when we see the contraption that Poirot wears at night to keep his moustaches safe. It makes him look a bit like Hannibal Lecter. Close your eyes at that point. This being Branagh. Poirot is Branagh-ed, Branagh is certainly not Poirot-ed. Branagh is incapable of playing him as ‘a ridiculous little man’ so there is longing in the gazing at a photo of Katherine and there is manly striding and Poirot does clever things with his stick. The beginning sequence is extremely bizarre. Poirot solving the Middle East crisis while measuring the height of his oeufs. I’m sorry if that line is obscure but you’ll just have to go and watch it to see what I mean. I suppose the purpose behind it is to inform us that Poirot is clever and odd and it certainly does that! The plot is changed somewhat from the book, which is a relief because if it hadn’t been there would have been endless scenes of Poirot interviewing suspects and going. ‘Làlà …précisément… mon cher and eh bien mon ami…’ and nothing much else. Fortunately, we have introduced here a stabbing, a shooting and a chase and this livens things up no end in comparison to the book. In one scene Poirot strides across the top of the snow-covered train and he keeps his footing. Phew! The settings are all very beautiful. We have a lovely train, we have thrusting pistons, we have steam and we have snow-filled valleys, snow drifts and snow falls. Yes, there’s lots of lovely snow and the scene when the train steams out of Istanbul is particularly gorgeous. I love all that. Now to the rest of the cast. I could have done with a great deal more of Olivia Colman, a woman who can do no wrong in my eyes. Here she gets to order the fish, play some cards with Judi Dench and utter a few lines in German. I could have done with more of Judi Dench as well, if it comes to that, although she does look very splendid in velvet and toque. Derek Jacobi gets to say more and is as always eminently watchable. Johnny Depp plays a rotter perfectly well and can do this kind of thing standing on his head so can Willem Dafoe and Penelope Cruz and Michelle Pfeiffer. The ones who stand out are not the starry ones but more Josh Gad as Hector McQueen, Phil Dunster as Col. John Armstrong and Leslie Odom as Dr Arbuthnot. I was looking forward to the product placement episode that I had been warned about in a review. If you have not heard of GODIVA CAKES you will certainly know about them at the end of this film. And Poirot does utter the immortal lines ‘I lerve theese leetle cecks.’ It is a startlingly stand-alone line. It’s not even as if he says, ‘The knife is hidden in these leetle cecks.’ or ‘Theese leetle cecks are filled with arsenic.’ No, it is apropos of nothing that he lerves them. I wonder how much money Godiva paid for the privilege of having Poirot utter this line. And I wonder if the cecks will follow Poirot to the Nile. I worry the chocolate might melt in all that heat. Mind you, I worry that Branagh’s moustache might get a bit bedraggled as well. At the end of the film Poirot is summoned to Egypt so we know that’s where he’s heading next. I think Ken will look very nice in the linen suit and the panama which he is probably being measured for as I type. Would I recommend it? Well, I think your enjoyment will depend on two things. First your view of Kenneth Branagh, who is in my opinion a bit of a marmite actor. If you don’t mind lots of close ups of his big, angsty blue eyes, you’ll be fine, if not, it’ll be a long couple of hours. Second, if you’re someone who knows Agatha Christie’s writing very well and wants a film that reflects that, the depiction of Poirot may well infuriate you. Probably best to give this a miss and seeks out the DVD of David Suchet’s version or Albert Finney’s, both of whom are much closer to the original. Finally, if you would also like to experiment with your own moustaches here is a lovely box of moustaches I spied in Paperchase. You can get to choose between six moustache styles: traditional gent, cowboy, rusty brush, Italian plumber, oil baron and Abra-Kadabra! (I know, I know but I’m only writing down what’s on the packet). Poirot’s incidentally is closest to traditional gent. This being my own product placement. Paperchase, darling, if you happen to be reading, I’m a writer so how about notebooks for life. Oh, and pens I could do with some pens as well, especially those fancy ones you lock in the glass cabinets. Waiting to hear from you. Thanking you ever so, as Marilyn might once have said. Have you seen the film? What did you think of it and Branagh as Poirot? Couldn’t we at least have a train on the cover? It has probably not escaped your notice (unless you are living in Antarctica with penguins) that there is a new film out of Agatha Christie’s MURDER ON THE ORIENT EXPRESS. It hasn’t escaped my notice because there are ads for it on the side of London buses and when the 22 stops in traffic outside my flat (which it has been doing a lot recently due to heavy plant activity – not triffids), I have a very nice view of the cast. Kenneth Branagh, sporting luxuriant moustaches, is playing Poirot and directing it. In preparation for this wildly exciting event I read the book and here is my imagined dialogue between Agatha and an unnamed modern day literary agent after the agent has read it. Agent: Is this a first draft? Agatha: Oh dear, well no I didn’t see it as such. Agent: (sighs) But where are the descriptions? As it stands it might just as well be MURDER ON THE 7.15 CROYDON TRAM. You say the train is stuck in a snowdrift but where is the snow? There is no indication of the snow anywhere. Does it melt immediately? Does no one look out of a window and see it? Does no one scrunch a snowball or throw it? Agatha: Oh dear you obviously don’t like it at all. Agent: It’s not that I don’t like it but there are no descriptions. I want to be able to see it. I want snow, I want lush interiors. I mean frankly you wouldn’t really know it was taking place on a train. What do the cabins look like? And if it comes to that what do the people look like. Agatha: I do describe the people I think. Agent: She’s a drag queen or something. Agatha: Oh you mean the Princess Dragomiroff. Agent: Oh yes, that’s right – well simply telling us she’s ugly doesn’t tell us much. What kind of ugly? Agatha: But there’s the yellow toad-like features and the toque. Agatha: The toque, the toque, I describe her as wearing a toque. Agent: What is that – some sort of otter? Agent: Well, can’t he fall in love with one of the suspects. Agatha: No, that wouldn’t do at all he is a sexless individual with a large brain. Agent: Whatever made you think that would be a good idea, darling? Agatha: Well, my sales. So far Poirot has appeared in seven novels one play and one short stories and he has always been the same. I can’t change him now. My fans wouldn’t like it. Agatha: Are you still there? Agatha (tentatively): What did you think of the plot? Agent: For pretty much anything darling. Yes, that’s it longing… Now then I can’t hang on here sorting this out for you but basically it’s plot B+ and all the rest C-. Have another go at it and bung it back to me in a month. Poirot scrunched the lush snow into a ball and filled with longing threw it playfully at the Princess. It struck her toque and she laughed gaily galloping through the snow towards him. She might have been the ugliest woman in the world but to him her yellow toad-like features were the epitome of beauty … Suddenly, out of nowhere an otter appeared scything through the lush snow. It threw itself at his face. It latched onto his lush moustaches. Poirot screamed as it dawned on him too late – the otter had done it! So here’s the question. Are you a fan of Agatha, Poirot, the books the films? And what kind of Poirot do you think Ken will be. I can’t imagine him playing him as a sexless brain can you? After all, Ken is always the hero – so what’s going to happen? My guess is a bit of longing and some manly striding. Anyway, I’m off to see it tomorrow and I can’t wait. Apparently there is an outrageous piece of product placement which produces this piece of dialogue from Poirot: ‘Ah, lerve theeese leeetle cecks’. The cecks incidentally are of the Great British Bake Off variety. And so that you can excercise yeur leetle greh cells which I know you long to do, answer this. What was the title of the German version of the book? For the last five days the night time noises I’m used to have been replaced with different ones. Instead of police sirens, the steady rumble of the tube and couples arguing drunkenly on the corner, there has been the call of the muezzin, ferocious cat fights and the crow of an exuberant cockerel that didn’t bother waiting for dawn to let us know he was there. Light fell differently here, brighter, whiter, and my thoughts began to fall at different angles as well. I did a little bit of writing to keep my hand in. If I let it go too long it feels very far away when I come back to it. So I pat its head and put down a bowl of milk. I don’t want it to be sulking or eating me alive when I pick up my pen again. I was trying to write scenes set in Oxford in January in 1643 in a bitterly cold winter when the temperature around me was rising to 40 degrees. And it was fine. The imagination finds something to trigger it and I found myself using the sound of the pumps in the swimming pool to conjure a scene by the river and a man remembering the first time he was kissed one hot summer day under the fronds of a willow tree. Now I am back and during my absence my morning glory/bindweed has developed buds. I feared it would flower while I was away but it has waited. Perhaps it liked its holiday from me. All that intense staring and wondering if and when. I’ve also liked my holiday from me. Jumped somewhere else for a while where the light falls differently and dates are not something you pick up in the supermarket but things that hang in yellow abundance above your head and pelt you while you are swimming. And the hours of the day are marked by the call of the muezzin. Prayer woven into everyday life as naturally as breathing. And the images that lodge in my mind? A woman wearing a burka riding a bike along a desert motorway towards the oncoming traffic. Large coloured stones in the middle of a roundabout, like things a giant child might have fashioned out of plasticine and then abandoned. A delicate piece of glowing purple neon attached to a broken down building on the side of a hot, dusty road, hinting at a more glamorous past. Oh, what a lovely sight! Delighted to receive this photo of The Return of the Courtesan in Heffers the famous Cambridge bookshop. Thank you to Susan Grossey who sent it to me! If you haven’t read her historical financial crime novels figuring Constable Sam Plank and set in Regency London then you are definitely missing out. So, many thanks to Susan and also to Heffers! 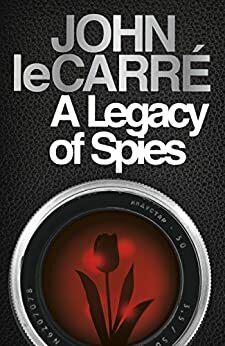 Off last night to see an evening with John le Carré who has a new book out, A Legacy of Spies, which signals the return of George Smiley, the spymaster who has appeared in many of his novels. Part of the purpose of the evening was to raise funds for Médecin Sans Frontières (MSF – Doctors without Borders), a medical charity which works in war zones, and an organization that le Carré is devoted to. A short film told us that MSF had treated 504,500 men women and children in the crisis in Yemen. The evening involved several short films in which actors, directors, and screenwriters who have worked on adaptations of le Carré’s books talked about their experiences. The people included Michael Jayston, (Peter Guillam in Tinker Tailor Soldier Spy on TV), Simon Russell Beale who played Smiley in the Radio 4 adaptations of le Carré’s books and Tim Hiddleston and Olivia Colman, who had played characters in TV adaptation of The Night Manager. Of Smiley, Simon R-B, who has played him most, albeit on radio, described his intense melancholia. Hiddleston commented on Smiley’s quiet heroism. When asked what he might ask Smiley if he came face to face with him Simon R-B said he’d run away from him. He wouldn’t ask him anything because he was so intimidatingly clever. First le Carré gave an hour long lecture then after an interval he was interviewed by Jon Snow of Channel 4 news and there was a Q&A. The origins of Smiley was a character called John Bingham who le Carré worked with in section F4 of MI5. This was before he went and worked for MI6, convivially known by MI5 as ‘those shits across the park.’ Bingham had run double agents during the Second World War and posed as a German officer. He was also a thriller writer. From Bingham came some aspects of the physical Smiley – the nakedness of his face when he took off his glasses and the habit he had of polishing his glasses with the end of his tie. Bingham was an aristocrat, an Irish peer, the 7th Baron Clanmorris, and le Carré said that he couldn’t make Smiley an aristocrat, that wouldn’t have done at all, so he made his wife Lady Anne one instead. He said that Bingham was a proxy father figure and mentor to the younger spies in his section. He went on to discuss the various actors who had played Smiley on film and TV: Rupert Davies, James Mason, Denholm Elliott, Alec Guinness and Gary Oldman. Mason actually played a character called Dobbs in The Deadly Affair (based on the book Call for the Dead) because the Americans did not like the name Smiley. He said that the filming of the character involved a certain personal loss for him of the Smiley of his imagination because the character was made physical but that of course the upside was that his work reached a much wider audience. At the end he read out an imaginary letter from a Daily Telegraph reader complaining that he couldn’t bring Smiley back because if one stayed true to the books Smiley would be 104 (or thereabouts). He countered this by saying that it was poetic license. Smiley was alive in his imagination and he was alive so why not? Of course his millions of fans will feel exactly the same. Jon Snow began by asking him about his father. Le Carré had discovered that his father, who was a con-man and a crook, had a Stasi (East German secret service) file and it appeared to indicate that he was an illegal arms dealer. He said that the Stasi had gone to the trouble of sending spies to his father’s office in Jermyn Street and marking where the safe was and also where the telex machine was. Q. Would you recommend the secret service as a career? He said if you were good at maths they’d send you to Cheltenham. If you were a seducer, befriender and liar you’d be good for MI6, although in the present climate you should think about the second half of your career/life because you might not have one. Q. Do you think the US has lost its senses? He said that what was happening in America was ‘truly, seriously bad’, that the stages Trump was going through – the fake news, and the assaults on the justice system were the same as those during the rise of fascism in the thirties in Japan, Spain and Germany. That kind of behaviour was infectious and toxic and he cited the use of the expression ‘fake news’ by Aung San Suu Kyi in Myanmar in dismissing the reporting on the assaults on the Rohingya muslims who are fleeing into Bangladesh. Q. Which of your own characters do you most relate to? He said that was Peter Guillam who works for Smiley and reappears in A Legacy of Spies. JS said I thought so. Q. Was Graham Greene an influence? Yes, his early works were. He had read them in his adolescence and that Greene gave a very generous quote for his book The Spy who came in from the Cold. However he said that the big difference between Greene and himself was that Greene had God in his books and there was no God in his own books. He also said that Greene had a dotty political streak and flirted with communism but he said he was hypnotic to meet. Maurice Oldfield head of MI6 said that Greene was a bad spy because he embellished his reports. Q. On his writing methods. He talked about the importance of making notes as soon as possible, even when he was drunk. As an example he said on your first day in Moscow what you notice is the smell of Russian petrol by the second day you’ve got used to it and you won’t register it anymore. He writes long hand. He said this produces a lot of paper and that when the Bodleian Library (to whom he was giving his paper) came and saw how many there were they had a fit. He starts with very little plot but always has the final frame in his mind and an idea of what he wants the audience to feel at that point. His wife reads what he writes and he is influenced by her response especially if there is a deafening silence. He talked about a mutual understanding between them about his work. He writes every day. He was asked by Jon Snow about his relationship to MSF and le Carré said that he had been struck by their courage and devotion and Jon Snow said that they were the most trustworthy organization for journalists reporting from war zones. There was a very poignant moment when le Carré asked Snow how he endured the human suffering he comes across in his reporting. He himself had been very effected by the research he does for his books, especially by seeing the effect of Big Pharma in Kenya and Sudan, the basis of his book The Constant Gardener. I came away from the event thinking that le Carré is a man who cares passionately about the world. Olivia Colman described him as being, ‘Everything you would hope he would be.’ A beautiful description that rang absolutely true. Peter Straughan who wrote the screenplay for the film of TTSS said le Carré was ‘still an angry young man … like Orwell always in opposition’. Angry certainly but also erudite, charming, witty and with a passionate sense of injustice. He’s certainly not going gentle into that good night. What more could you ask for from a novelist? We are lucky to have him. A tiger with the odd elegant leaf hanging from his paws. It has nipped its way up all the hanging doodahs (technical expression that) in my window and a rather hungry looking tendril is now hanging speculatively about a foot over my head. I feel like Charles Dance in Alien 3. I’m not going to put the You Tube link in here because it completely terrified me watching it just now but if you want that pleasure type in Alien 3 and Dr Clemens/Charles Dance dies/killed and you’ll get the general idea. However all you really need to know is that it doesn’t end well for him. And there is not a flower in sight. Not a single one. If you don’t hear from me again you’ll know that Sigourney didn’t hear my thcreams either. Tell me your bad growing experiences. All of them. In technicolour. It’ll make me feel so much better about things. And if you have any tips about how to get my morning glory to flower tell me that as well. I’m very honoured to be a guest of Andrea Stephenson on the wonderful Harvesting Hecate blog (click on the link above). Here I am writing about Veronica Franco, the woman who was the basis for my character Tullia Buffo, in my book The Return of the Courtesan. Please also take the time to have a look around Andrea’s blog. She writes on creativity, writing, the natural world and the seasons with a clarity and beauty which is quite outstanding. Shakespeare’s last play is generally considered to be THE TEMPEST, first performed in 1611, and if that’s the case his last word is the last word of that play. I went to see the Royal Shakespeare Company production at the Barbican in London a few weeks ago. The production stood out for two reasons: First, the extraordinary special effects, including an amazing hologram of drowning men, during the storm scene that kicks everything off. Secondly, for the remarkable performance of Simon Russell Beale as Prospero. Simon Russell Beale is a man who speaks Shakespearean verse as if it’s his first language which makes him very easy to understand. If you want to read a quick precis of the play before going any further you’ll find it here. Incidentally the children in the video are incredibly sweet. A final word on the use of special effects in Shakespeare. THE TEMPEST, because the main character is a powerful magician and there is a strong supernatural element, lends itself to this kind of production. The storm and also the depiction of Ariel trapped in a tree by Sycorax the witch will stay with me for a very long time. But you need exceptionally good actors to act with avatars and holograms otherwise the special effects overwhelm the verse. Fortunately there aren’t any special effects that I can imagine overwhelming Russell Beale, so this production is a triumph! It’s on until the 18th August and I highly recommend it. Hats off – or in this case I think actually my great uncle Norman’s top hat off, to all those of you who nominated my book THE RETURN OF THE COURTESAN for The Guardian’s NOT THE BOOKER PRIZE. It is on a glorious long list of 150! Not only hats off but hats off with sunflowers. Thank you all so very much! But wouldn’t it be ABSOLUTELY THRILLING to get THE RETURN OF THE COURTESAN onto the SHORT LIST? And if you do, apart from loving you for ever, I will post a picture of myself in my great uncle’s pith helmet. You think I jest? Well, here it is patiently awaiting its elevation to my head! It longs to be placed there, it really does and only you can make it happen.